To celebrate the foreign release of my Medallion Press novel, The Viking’s Witch, I’m sharing an “inside look” at the making of the book. In the last blog, I talked about how the book came about, the research involved, and the violence that takes place in the story. Now I’ll offer some insight into the origins and development of the characters, as well as Odaria’s magic “witch” powers. When I create my heroes and heroines I always give them “baggage” and flaws along with lots of problems to overcome. 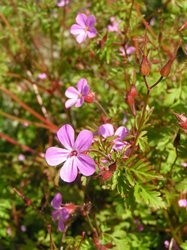 This way, they can grow and change over the course of the book. Odaria is a strong-willed “witch” who is tired of being abused and ridiculed by the people in her village. She swears she doesn’t need anyone’s help to get by. Rothgar was once a powerful warrior, but a personal tragedy has softened him and left him broken and unwilling to love anyone again. When they meet up, they each play off the others’ weaknesses. Odaria has no qualms about standing up to Rothgar and arguing with him, and he respects her willful and fearless behavior. Eventually they realize that they need (and want) to be with each other forever. I used to work with a woman whose last name was Nordskog and I told her that one day I’d use her name in a book, so I did! Nordskog is a violent, vicious berserkr and has a history with Rothgar dating from Rothgar’s old fighting days. Nordskog’s hatred of Karnik draws him closer to Rothgar’s side as the story develops. After Odaria helps heal his leg, Nordskog develops a fondness for her, as well. He’s an impulsive brute, but he’s not stupid. He knows that Rothgar is wealthy and will reward him for his services and loyalty. But if readers thought Nordskog was bad, the antagonist, Brennan, is even worse. Brennan has been described by one reviewer as “a perfectly evil villain” which was exactly my intention. I wanted to portray him as an arrogant, self-righteous SOB – but not have his character be too over the top. Brennan is a lying, murdering, religious zealot and that makes him dangerous to Odaria and the other villagers. Most of the terrible things he’s done happen off page and we learn about them through Odaria. Each time I wrote a scene for, or about, Brennan, I made him a little more unstable and psychotic, so by the end of the book readers see that he needs to learn his lesson and pay for what he’s done. Odaria use her “powers” for self-preservation and to get revenge on the people who hurt her. Rothgar doesn’t believe in her “magic” and thinks she’s merely pretending to be a witch to frighten people. But after a highly-charged interaction with Brennan, Rothgar gets a taste of what Odaria could really do if she set her mind to it. 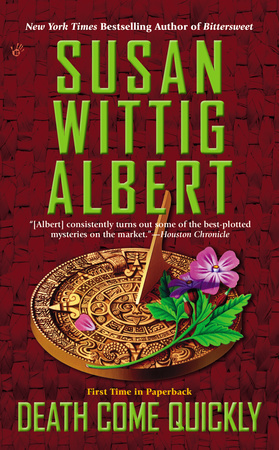 I loved showing readers (and Rothgar) Odaria’s powers of clairvoyance, telekinesis, and psychometry. The scenes that included the “magic” elements were a lot of fun to write. I’ve always been interested in psychic phenomena and other “New Age” subjects, so it was easy for me to incorporate what I know into Odaria’s character. What can be better than sitting down in your armchair and reading a cozy mystery late at night? You don’t need a detective’s notebook and a bunch of clues to figure that out. 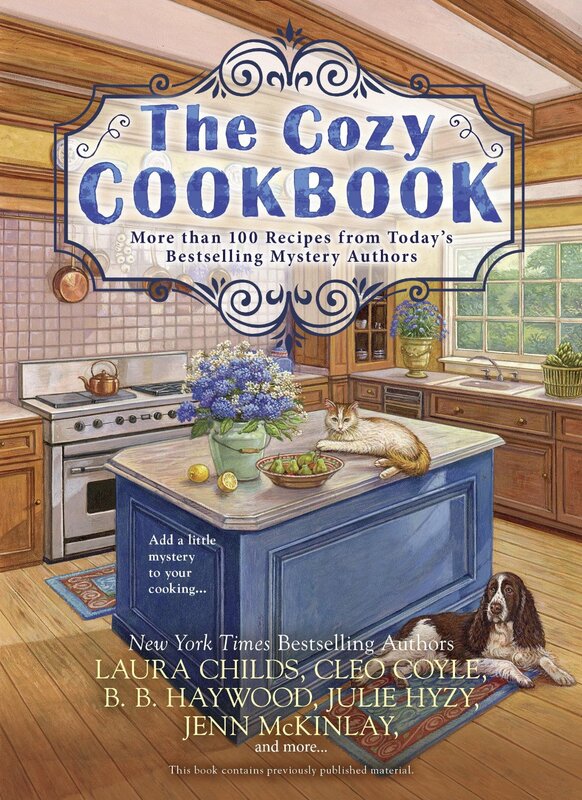 New York Times Bestselling cozy mystery authors have gathered their favorite recipes for “The Cozy Cookbook.” Over one hundred delicious recipes have been chosen from Avery Aames/Daryl Wood Gerber, Ellery Adams, Connie Archer, Leslie Budewitz, Laura Childs, Cleo Coyle, Victoria Hamilton, B.B. Haywood, Julie Hyzy, Jenn McKinlay and Paige Shelton. What a clever way to introduce Berkley Prime Crime mystery authors that you may not have read yet. Take for example, Julie Hyzy, who writes the White House Chef Mysteries and Manor House Mysteries. One of her latest titles is “All the President’s Menus.” The first excerpt in the cookbook is from “State of the Onion,” which introduces Olivia Paras, who has the unbelievable job of being a White House Assistant Chef. Talk about wanting the most respected job in a United States kitchen. Her dream was to become Executive Chef. Does she get her wish? Read the series and find out. The Eggs Benedict recipe from “Eggsecutive Orders” is featured in the breakfast section of the cookbook, along with Delilah’s Grilled Breakfast Sandwich from Avery Aames’ “Clobbered by Camembert” mystery. Ellery Adams “Charmed Pie Shoppe Mystery, “Pecan Pies and Homicides,” is the second featured excerpt. I love all the elegant covers chosen for her series which is set in the magical town of Havenwood, Georgia. Baker Ella Mae LeFaye is the amateur sleuth whose perspective goes beyond the ingredients of her recipes. She’s concerned about the well-being of her neighbors and protecting her town from dark forces. You’ll find a recipe for “Charmed Bacon-Lattice Breakfast Pie” from Ellery and a “Spinach Quiche” from Julie that would be perfect for Mother’s Day. Who doesn’t love a hot bowl of soup on a cold winter night? Connie Archer’s mystery “A Spoonful of Murder” is the first in her “Soup Lover” Mystery Series. The excerpt shares how Lucky Jamieson not only has to deal with the death of her parents, but the responsibility of operating her family’s business, “By the Spoonful.” Don’t forget to try “Jenna’s Monte Cristo Sandwich,” with your cup of soup. The recipe is from Daryl Wood Gerber’s “Inherit the Word.” Loved the book. After Julie Hyzy’s “Hail to the Chef” excerpt there’s a great cinnamon bread recipe for those willing to make a sweet treat loved for generations. Connie Archer’s Zucchini Bread and Victoria Hamilton’s Golden Acres Banana-Bran Muffins are also included. The Cozy Cookbook is a must for your cookbook shelf or the perfect gift for your Mother on Mother’s Day. The type is easy to read. The excerpts are like appetizers and the books are probably a keystroke away on amazon.com. You’ll probably have to clear another shelf just for the authors mentioned in this book. What a great idea to put this collection together. 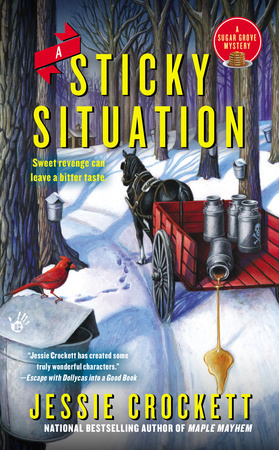 In the third book of Jessie Crockett’s Sugar Grove Mysteries, trouble arrives in threes. About the same time Dani Greene’s eccentric Aunt Hazel comes to town for the Sugar Grove Maple Festival, Dani is called to the basement of town hall by Russ Collins, a contractor, who excels in making excuses and not working, to point out what he uncovered in the coal bin. Town Hall is the site of a former Opera House. The restoration was subsidized by Greener Pastures, the long-established Greene Family business. Russ finds a skeleton and soon the police come to the scene. The restoration comes to a halt, then word is Dani’s cousin, Jade, spoiled and perfect in every way, has purchased the old, vacant, general store in town. She works quickly to renovate the building and make it a sap wine winery. Not only is she going to pump the family’s maple tree sap for free, she’s taking over Dani’s room, as well. She’ll be interfering with sap collection for Greener Pasture’s maple syrup production and invading Dani’s privacy. 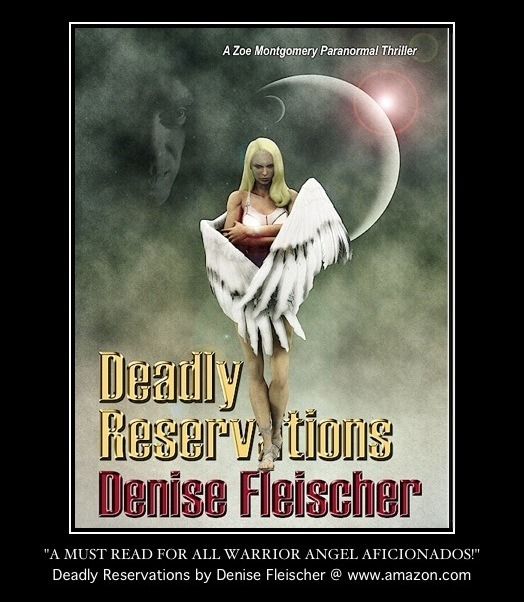 Knowing Tansey was affected by the news of the recently found remains, Dani speaks with Doc to learn why and finds out a drifter, who came to town 30 years ago, did odd jobs at Tansey’s home. His name was Gaylord, but everyone called him “Spooner” because he had a special way of playing spoons. He also got the attention of a lot of town women and because of that was not trusted. One day after the festival, all the money raised was stolen. Because Spooner was nowhere to be found, they pinned the crime on him. 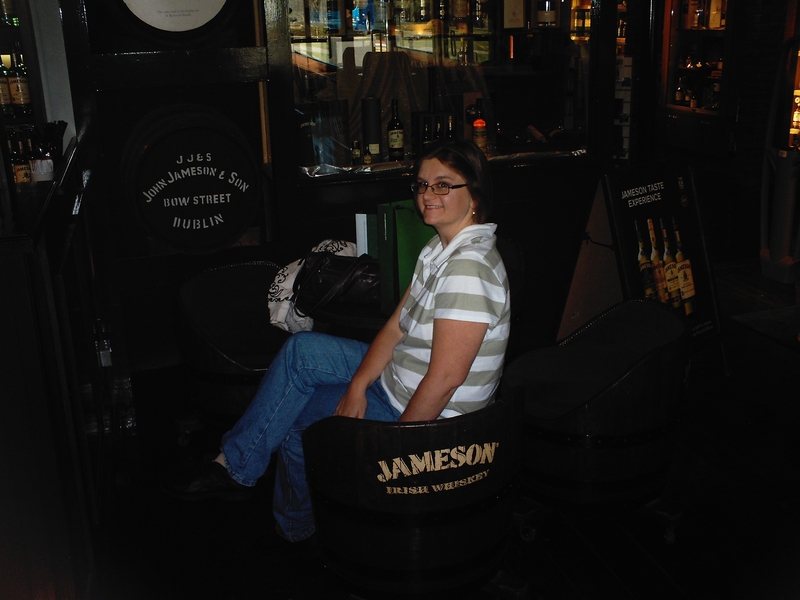 There went Tansey’s opportunity for happiness and the future of the baby she was carrying. Tansey asks Dani to investigate because she’s the police chief’s goddaughter and “her” renovation project unearthed the dead man’s remains. Any help clearing Spooner’s name would be greatly appreciated. A Sticky Situation gives you a taste of how maple syrup is produced. It introduces a tight-knit family that doesn’t fit into any character building model. They are who they want to be and that’s all that matters. I adored all but the spoiled cousin, but she did show a sign of maturity later on in the book. As for the long deceased, recently found young man, I really felt for him. Only his killer knew he was dead and to go thirty years without being found and believed to be a criminal, I can’t see him resting in peace. I’d like to know why the detectives of the past didn’t investigate further. They just assumed he was the guilty party because he disappeared. The storyline was fast paced and edited well, I only wish I read the other two books in the series to find out what led Dani to being an amateur sleuth. Have you ever been to a Renaissance Faire or a living history museum? I’ve been to both, and I find them fascinating. At the Renaissance Faire I attended with my family many years ago, my son was knighted Sir Scooby of Doo (because he was wearing a Scooby Doo shirt) by the queen. In lieu of a sword, she used a plunger. Minstrels played unusual instruments—one even played crystal water glasses. I talked plays with William Shakespeare, watched a chess match in which the playing pieces were human, and wandered through booth after booth of wares. The costumes were beautiful, fun, or both. The living history museum we visited was a working farm set in 1791. We learned about eighteenth century cooking tools and techniques in the log cabin’s kitchen. A costumed tour guide spoke of President Washington and asked what we thought of that upstart Andrew Jackson. I said I believed he’d become President one day, and the woman scoffed. We attended demonstrations of weaving, learned about the dye, medicinal, and culinary plants grown in the garden, and saw the Cotswold sheep. In WICKED STITCH (an RT Top Pick! ), embroidery shop owner Marcy Singer is thrilled to be taking part in a two-week Renaissance Faire. Tallulah Falls residents will be able to reside in the time of William Shakespeare’s Macbeth. The RenFaire’s attractions are centered around the play, even down to Hecate and the three witches who are on hand to divine the future for faire-goers. Clara, a petty woman who has opened a competing shop next door to Marcy’s shop, the Seven-Year Stitch, has been assigned the booth next to Marcy’s. When Marcy comes to set up her booth, she peeps into Clara’s spot and realizes that something isn’t right. Clara is lying on her side in an overturned rocking chair. She has been strangled to death with the scarf she’d been knitting. Now Marcy has to get to the bottom of this most deadly yarn. Readers please comment below on your experiences in “stepping back in time” for a chance to win a signed copy of WICKED STITCH. International readers will have the chance to win an ebook copy of WICKED STITCH gifted from their retailer of choice. 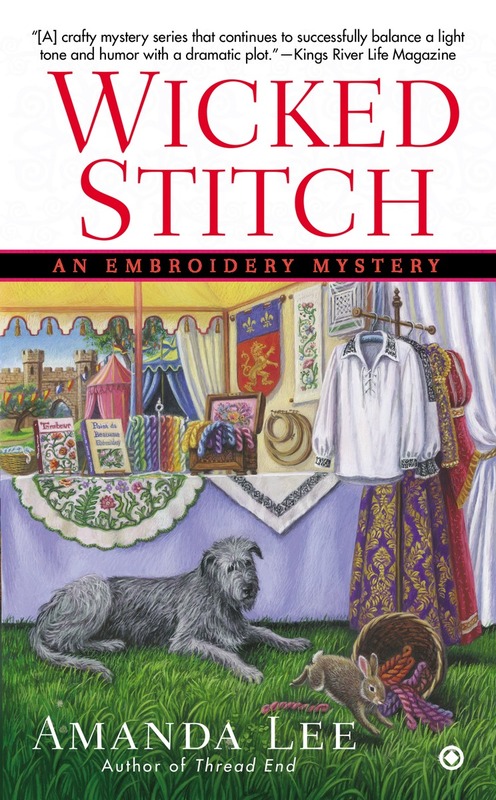 Amanda Lee (also writing as Gayle Trent) writes the Embroidery Mystery series which features a heroine who recently moved to the Oregon coast to open an embroidery specialty shop. Marcy Singer left her home in San Francisco, along with the humiliation of being left at the altar, in order to move to Tallulah Falls and realize her dream of owning her own shop. She takes along her faithful companion, a one-year-old Irish wolfhound named Angus O’Ruff. She makes many new friends in Tallulah Falls, but she also makes a few enemies. Thankfully, her best friend Sadie MacKenzie and her husband Blake run the coffeehouse right down the street from Marcy’s shop, the Seven-Year Stitch; and Detective Ted Nash always has her back. WEDDING DURESS is now available. Each and every member of the Sweet Briar Ladies’ Society Sewing Circle is in Tori Sinclair’s wedding party. Eating at Debbie’s Bakery is not advisable during the days leading up to donning a wedding dress. A sewing circle meeting is the perfect disguise for a bridal shower. One member of the sewing circle was injured in the writing of this book. The ring bearer is not a human. Something very important is revealed to be fake. Someone very special is coming to the wedding…all the way from New York City. All of the women have a celebrity crush they’d like to marry. One member of the sewing circle will come very close to being permanently thrown out of the group. So grab your copy of Wedding Duress (I mean, your invitation), put on your dancing shoes, and take a seat in the church. This is going to be one wedding lead-up you’re not going to want to miss. Elizabeth Lynn Casey is the national best-selling author of the Southern Sewing Circle Mysteries. 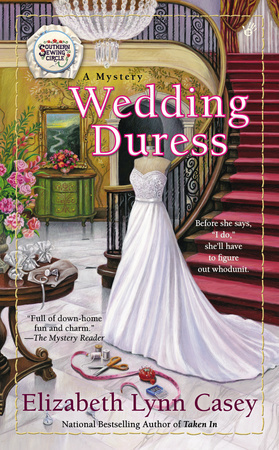 The latest installment in the series, WEDDING DURESS, has just released. In addition to this series, Elizabeth also pens the Amish Mysteries under her own name, Laura Bradford. For more information, visit: www.elizabethlynncasey.com or www.laurabradford.com . Hoping to leave behind the image of catching her boyfriend, Mason Kilmarty, in bed with her best friend, Andrea, Peggy goes on a shopping trip to Scotland to purchase merchandise for her ScotShop. In Perthshire, at the Sinclair’s Bed & Breakfast she could set aside her frustration for her ex-boyfriend and focus on purchasing Scottish clothing that she knows will sell well. Knowing her too well, the Sinclairs figure out what is bothering Peggy and help soften the emotional blow. At the end of Atholl Road in Pitlochry’s main shopping street, Peggy is drawn to a quaint shop on a side street bordered by a low wall of stacked stone in between two rowan trees. In this mysterious shop, Peggy finds a beautiful vintage shawl and briefly learns that it had been passed down to the eldest great-granddaughter, but the store owner didn’t have a daughter to pass it down to. She learned that it was saved from a fire that destroyed the village. The women in the store seemed to think the shawl was waiting for Peggy. Unable to pass up this special find, Peggy purchases the Farquharson clan shawl. As she leaves the shop, she feels like walking a mile north of town to Ben y Vrackie, a nearby mountain. Restless, she walks towards a brook and it is there she meets a man “almost palpable, but there was a wavering shimmer around him” and he thought she was his Peigi. He suddenly realizes she is not the woman he loves and wonders why she is on his land. Apparently, he’s from the mid-1300s, which logically made him a ghost. Macbeath came forward when he heard his Peigi call out to him. Both had been dead for seven hundred years so the question is why is he suddenly awakened? Because she could not part with the beautiful vintage shawl, it appeared the ritual of letting go was the only way to free him. Upon returning home to Hamelin, Vermont, she learns that her ghostly companion did not remain in Scotland because the ritual didn’t work. After a brief discussion about things being very different than they were during his time, she nicknames him Dirk, which means dagger. In addition to his ghostly existence not allowing him to do even the simplest of tasks, he is not allowed to venture too far from her shawl. Upon returning to her Scotshop with Dirk, Peggy notices that her favorite mannequin and her solid maple bookcase were knocked down along with broken merchandise. She calls Gilda and cousin, Shoe, who work for her, to help pick up the fallen bookcase. It wasn’t something she could do alone and Dirk couldn’t lend a hand. With great effort they manage to stand up the bookcase. To their surprise, underneath it was Peggy’s dead ex-boyfriend. They immediately call the police. Captain Harper of the Hamelin Police and Police Chief Campbell come to the scene of the accident or crime. Evidence is gathered and an arrest is made, but was the right man arrested? Who killed Mason and why? 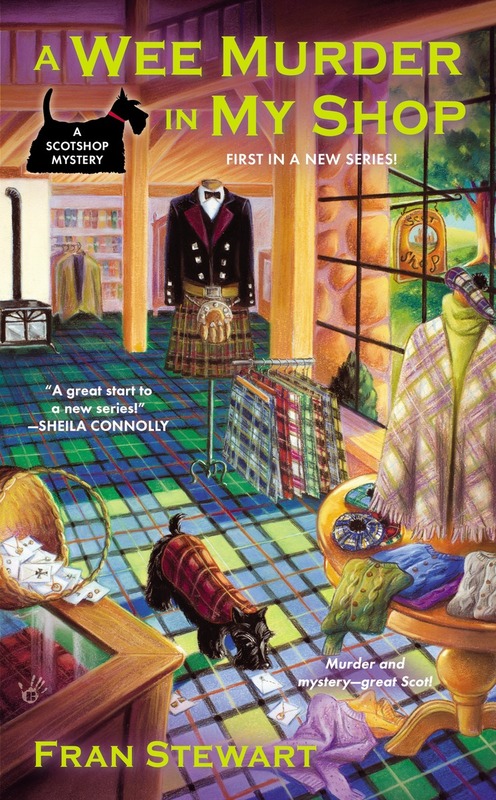 A WEE MURDER IN MY SHOP is one of those books you never want to end. The reason is simply because you love the characters and it’s difficult to wait for the next book in the series. The storyline is easy to follow, but has its complex resolution. I don’t think it was anything you’d guess right away. The most interesting part of the book is the interaction between Peggy and Dirk. Dirk’s soul awakening without knowledge of his death is frightening and difficult to grasp. When realization raises its confused little head, the questions seem to fly. Dirk not only has to deal with the fact that he isn’t flesh, blood and bone, unable to do anything physical without Peggy’s assistance, but he is also in a future so far removed from what he is accustomed to that it’s alien. But he’s intelligent and curious and has a logical crime-solving mind. That can come in handy because you never know when you need a crime-solving partner.